First announced in the September 1921 Meccano Magazine, this part is very unusual in having been dropped from the range of outfits in 1929 (when it was included in all outfits from number 3 upwards), and then reintroduced in outfits 9 and 10 in 1937. It was never supplied in the lettered outfits. Later still, in 1962 it was quietly dropped from the number 9 outfit, and so it is not as common a part as you might first imagine. The most obvious change in the crankshaft is in the shaping of the central portion. Although DMS/EMP describe this as being a change from "pronounced curve" to "straight back", the curve isn't quite so pronounced as it sounds! In fact, the easier way to identify the style of crankshaft is that the "straight back" ones (shown below in this photo) have much more angled sides curving gently into the main shaft. Earlier "curved" crankshafts (shown top right) have sides that are perpendicular to, and sharply bent from, the main shaft. I believe that this change is approximately at the same time as WWII – all pre-war versions I've examined are as per the top example above, many being stamped appropriately, and all post-war ones are "straight". Note that the zinc 1970s example shown in the table below has the later-style curved sides, but the crank section is definitely curved! Corrections would be useful though! A more accurate dating can be obtained by looking at the ends of the axles. The very earliest crankshafts have cut-off ends (see left-hand example in this photo, with its nickel plating failing). The next example has been found in several outfits from the late 1920s, and has very significantly rounded ends (stamped Meccano FEA). 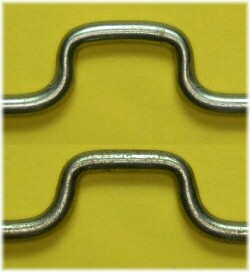 Examples from the late 1930s (middle in this photo) have 'standard' rounded ends, which carry across into the post-war example shown next. The right-hand-most crankshaft in the picture above is a 1990s French example, which (apart from being zinc rather than nickel plated) has cut ends, and is also a few millimetres over length compared with the surprisingly consistent Binns Road parts. For the moment, I won't distinguish between the 1929 and 1939 style ends shown above, as this change appears a little too subtle unless we get a lot more information. However, it appears to be fairly consistent so far. I don't have any of these -- do you have any pictures?